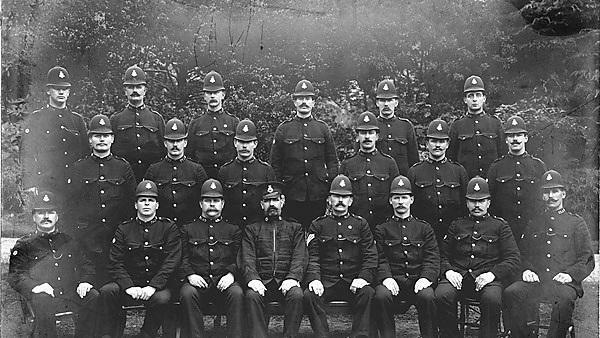 Devonport Police, 1913. Image credit: Plymouth City Council Central Library. We hosted witness seminars at the Devonport Guildhall in association with RIO - Real Ideas Organisation. This event formed part of a month long exhibition, providing real life context for community engagement about everyday offending in Devonport, Plymouth. The first seminar 'Policing everyday offending in Devonport' (10:00-12:00) focused on the experiences of dealing with offending and criminal activity in Devonport including testimony from current and retired police officers. The second seminar 'Community responses to everyday offending' (13:00-15:00) focused on the experience of those affected by criminal acts and those who were responsible for causing the offence. Witness seminars comprise a panel of witnesses who provide brief introductions, comment on their professional role, and their understanding of the topic and its relevance. They are asked questions to initiate a discussion highlighting different perspectives and experiences. The audience are invited to comment and ask further questions. This event was open to all and there was a one hour lunch break between the seminars. Dr Judith Rowbotham is a Visiting Research Fellow in the School of Law, Criminology and Government and co-founded the SOLON project with Kim Stevenson and is Co-director. She is also one of the general editors of the Routledge SOLON series. Her research interests include the presentation or reportage of the criminal justice system and issues of gender, violence and cultural comprehensions of the law in action, from the late-18th century to the present. She is a trustee of the South West Police Heritage Trust and is also involved in the Everyday Offending project.